It's a rude awakening for that rookie vacationer abroad when they try to plug in their gear for the night. Veteran jet-setters know that outlet shapes can vary wildly from country to country, which necessitates that most boring must-have for any world-traveler: A sackful of clunky power adapters. Awkward problem, elegant solution: The Twist Plus World Charging Station. 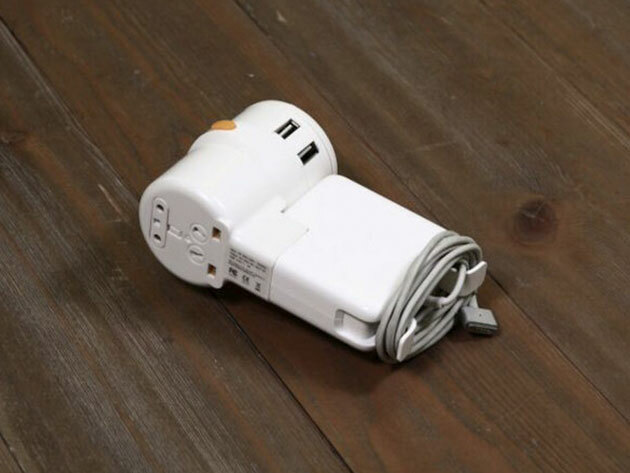 Essentially a skeleton key of international plugs, the Twist Plus rotates easily to change between one of four configurations most common to wall outlets in the US, UK, Australia, and Europe. In all, you're covered in more than 150 countries. And most travelers won't' need more than one: Just use one of the four USB ports to charge phones, tablets, laptops - even a MacBook. It's light, portable and comes with built-in fuse protection for that added bit of security. Originally priced at $45, the Twist Plus World Charging Station is now on sale at $31.99 - a 28% discount.